-h, --help Output this help. discover Find structural variant signatures in read alignments (BAM to SVSIG). call Call structural variants from SV signatures and assign genotypes (SVSIG to VCF). 1. Align PacBio reads to a reference genome, per movie. 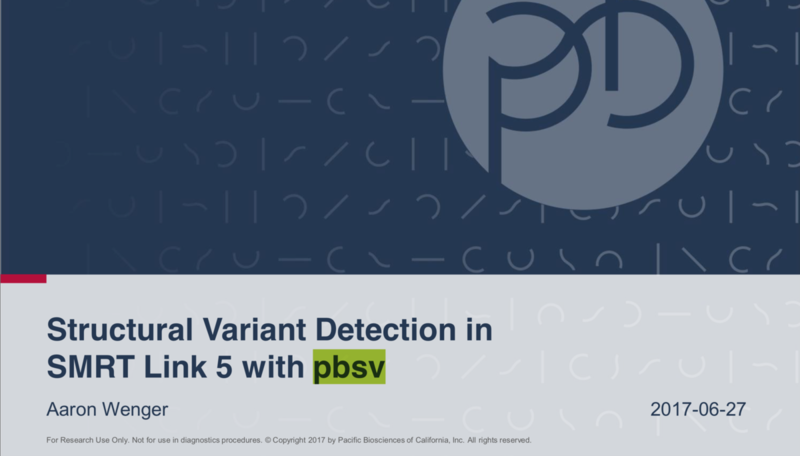 pbsv discover - Find structural variant (SV) signatures in read alignments (BAM to SVSIG). --log-file Log to a file, instead of stderr. -s,--sample Override sample name tag from BAM read group. -r,--region Limit discovery to this reference region: CHR|CHR:START-END. -b,--tandem-repeats Tandem repeat intervals for indel clustering. --resolved-tool-contract Use args from resolved tool contract. ref.in.bam|xml Coordinate-sorted aligned reads in which to identify SV signatures. ref.out.svsig.gz Structural variant signatures output. pbsv call - Call structural variants from SV signatures and assign genotypes (SVSIG to VCF). --ccs CCS optimized parameters: -A 1 -O 1 -S 0 -P 10. --annotations Annotate variants by comparing with sequences in fasta. Default annotations are ALU, L1, SVA. ref.fa|xml Reference genome assembly against which to call variants. ref.in.svsig.gz|fofn SV signatures from one or more samples. ref.out.vcf Variant call format (VCF) output.